Even in this, our new fangled GAA, the suits and ties in Croker have a lot of tinkering to do with the humdrum of an AGM. Some of the big clubs are fond of shuffling their soldiery like a game of musical chairs but not in this parish. The same faces, the same hall, - a different year. As with a lot of hurling hamlets, January gatherings in Cratloe’s schoolhouse rarely wander far from script. There are those who could tell you how many crows landed on either goal of the Hurling field on a given day, but come wind of an AGM, there seems to be a scramble for the trenches. Eugene McGee’s quip springs to mind - ‘God bless he who is early………..- if he can stand the loneliness’! You see, not every body gets goose bumps over the price of a bus to Ballyvaughan and whether for good or bad, we still await fisticuffs over who’ll look after the Scór. It’s little wonder then that a week of his tenure had passed, when a neighbour of Mick Gleeson’s threw out his hand to congratulate Cratloe GAA’s baffled new president. “Sure I suppose that’s a big job”, says Mick now with a nod. “Won’t the brown envelopes be flyin’ through the letterbox”? Now as a breed, hurling folk rarely court fuss but still Mick is still humbled. He has to be. Sit with him for ten minutes and you’ll find out why. The blood rolling through him must nearly be blue and white. It’s a fairly special thing to be able to bend your ear towards Mick and his cronies ‘talking hurling’. Their ‘tracing’ starts like a train pulling from a platform….slowly, slowly, slowly does it…until one puck of a ball leads onto another and the memories spew in full throttle. An ear-wigging lounge at the back of Setright’s has often been ferried around the hurling folds of East Clare on a Sunday night courtesy of Mick rallying stories against Frank O Brien. “Frank, Do you remember the day Pappy Callaghan and Pa Quain marked eachother? There wasn’t a leaf on a tree for four miles after them”. Like two young lads clapping a nursery rhyme, their tales of men and matches can nearly carry a tune. Funnily enough it actually was a rhyme that had me out looking for Michael the last time I met him. Rooting through Jimmy Smith’s collection of Clare Hurling Ballads in the school I came across - The Cratloe Gaels, pencilled back somewhere on the tail end of the 1800’s. I asked him if had he heard of the same tune at school when we were standing in the queue for the Post Office one day, and thought I’d be mannerly enough to give him the hint of a line or two. I had no sooner pursed my lips when Mick stepped in and with a litre of milk and sliced pan under his oxter, he rattled out the eight verses. How dare I! Later I was invited to Tobair an Airgead to put meaning to verse. But it’s not too easy to get hold of a President. Thankfully the first day I said I’d phone. Mick was out the back clipping a lawn while March threw a gap of sunlight. “Tonight won’t do!,”. “Aaah Jaysus Christ?” I thought. The next day the bonnet of his car was still purring and he had a hurry on his breath from counting cattle. Once again I turned for home, puzzled. You see on his next Birthday the same man will have 83 candles on his cake, - it seems on the well road ‘age’ is kept for cheese and wine. “Monday…Call up Monday”, he says. My evening came and the Gleeson’s had two chairs pulled up to the fire. Mick squints his eyes and we carry on where the post office had stalled us..
They’ll make a splendid seventeen. For county honours next year. And made the champions yield. Mick Corry and “Chest” O Brien. The singer sinks back into his chair and a lesson swivels from History to Geography. “Bearna Mhor or Murrane’s sluis gate is the boundary that cuts Moyhill from Ballymorris. It’s there to stop the Shannon flooding the corcasses. Below it the water would be very still in the summer time and when we were small, labourers on Ryan’s farm often learned to swim down there. Bearna Mhór would’ve been the boundary for the Uppers and Lowers of the time as well or the ‘Gaels’ and the ‘Rovers’ as they as this song says they were known as. They wouldn’t have been the same areas that play one another now but there may have been no united club in the parish at the time. The song would have been about a contest between the two at that time and it seems the rivalry was fierce. Ryan’s field where it was played would have been the Hollow or a nearby plot we knew as the Horse field”. “Jack Frost was from where the shop was here at the back of us. He looked after a share of teams in the parish later on. 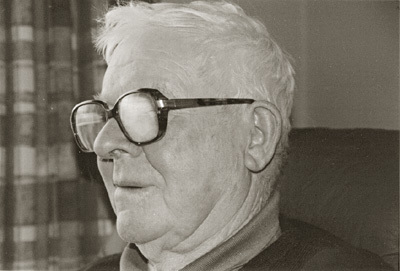 Bob Ryan was one of the Ballymorris Ryan’s from Bearna Mhór country. The Hickeys would have been ‘The Bomber’s crowd from over the back road and the Hogan’s would have been from Moyhill. One of those poor boys actually drowned down in that water after working at hay one time. He went into the water to cool down after filling a load and drowned inside. The priest at the time had to ride a horse down through the fields to anoint him. Mick Corry and Chest O Brien were Portdrine men. Mick lived where Carroll’s cattle pin is now and ‘Chest’ was Franks father. The Kinnevane’s and Carmody’s were Moyhill men too”. Bill Donahue, who Mick reckons lived somewhere around Paddy Macs cottage, seems to have hurled for the wrong side of the gauntlet that split Uppers and Lowers or as Mick knew it - ‘the cross’ and ‘the road’ and so his fate was to forever close out the song. None of the Gleesons wander too far from the cradle before they meet hurling. As a boy, Mick can still remember a wind up watch with a clasp sent home to his father from relations in America. 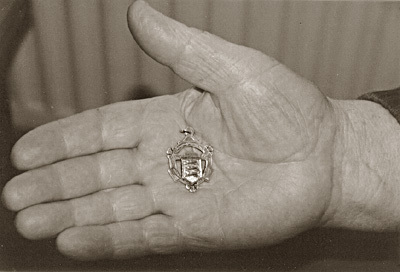 The chain, which hung from it, was decorated by a tournament medal won in Lahinch. In those days both hurlers and wives made the trip west on the train and a stroll on the beach was often coupled with a dash for a ball. Mick’s father led out some of those Cratloe teams and on his rounds counting cattle the captain’s son would often turn the corner at Setrights to be saluted by a local mouthing his Dad’s rallying motto from a window ledge. “Come on to Callura boys…Come on to Callura” – Callura, home to the Enright’s nowadays, is the townland on the Sixmilebridge road where the parish once togged. Like the bould Bill Donahue he sings of, our president too had once to tiptoe over a border to hurl. Himself and Mick Frost have Minor medals won with ‘The Bridge’ in 1940 when Cratloe found it hard to prop up a team. The favour was often returned and as a result only scant memories of Juvenile hurling remain in the area. His first trot out on an adult team arrived in 1942 and what a better way to start than a hullabaloo with the same neighbours? Cratloe drew Sixmilebridge in that season’s Intermediate championship and when both camps felt the trip to Newmarket would be too far out of the way in the days of the pushbike, a toss of a coin herded the crowds to the Hollow. “I know the game was on a Saturday evening”, he says, “ because I was tramming hay at the time inside in Rossmanagher with Joe O Gorman’s father and I had to run home to be in time for it”. “The Bridge arrived and sat down at the top of the hill above the holla’ and we were ready and togged out below them. Well if they were there yet, they wouldn’t come down! We’ll be down in a minute, we’ll be down in a minute, they were saying. When the evening turned to dusk they said it was too late to play and they’d play a challenge match. The Kennedy’s for us said they’d play no challenge and so I was thrown in with the Frosts on my first day and we gave them plenty of it”. “The next day was down for the Hollow again but a fella wheeled into the church car park on a bike after mass and said the Bridge were going to Newmarket for it. Some of our lads said the Bridge were making fools of us and they wouldn’t go. Cratloe came out of Newmarket beaten by a point without them”. When 1943 arrived the hat threw the chance for revenge. Following all the previous years bother it was decided Kilkishen would be best suited to hold the next derby between the neighbours. This time however, a result out-swelled the fuss of where the fixture would be played. The County Board could have brought Cratloe to the North Pole that year and they wouldn’t have flinched. Bragging rights had to cross the Garney at any cost. Among Cratloe’s armoury in the 40’s were the Frost brothers. Dr Bob hurled with the County from 45 to 49, won a Fitzgibbon with UCD and was a man Mick describes as a wizard on the field. Away from the grass however, it seems he took it a little easier. On the morning of the ‘Bridge game Bob lay down for a rest after Mass and when the time passed to saddle up for Kilkishen, Cratloe’s centre-forward was still out for the count on his pillow. When the team arrived in Kilkishen they found a village deserted until the priest had sent word that a mission in the church would have to delay the throw in for an hour. Needless to say, the message relayed itself back to Portdrine allowing a napping Bob to gather himself together for the game and as fortune would have it he played a blinder helping Cratloe defeat the old foe. That days ‘divine inspiration’ set the ‘Blues’ on their way to defeat Broadford later that summer and claim the clubs second Intermediate title. The same luck didn’t travel into the ranks of Senior Hurling with the blue and white. The following decade belonged to a famed rivalry between Tulla and Feakle who often drew crowds from across North Munster to watch their Sunday collisions in Kilkishen. Mick thinks it could largely have been Cratloe’s own fault. “We never trained hard enough for Senior”, he says. “ We could hurl anyone up and down a field for fifty minutes, but we always fell away at the end”. “We were never fit enough to win a Senior Championship”. You can imagine the headshaking then when Cratloe drew who else but an ‘Army’ amalgamation for their senior debut. Of course the Defence Forces may not have had the same ball handling as their opponents but ‘fuel’ wouldn’t be a problem. Invariably ‘legs’ won out over stick work and after losing a three-goal lead ‘the military’ showed Cratloe the door from the championship. So the medal from 43’ which he takes down from the window sill beside him is Mick’s best prize from all his trips to the Hallow’. Although he didn’t play, Mick is proud when he passes it over. Besides, medals have an awful legacy of being locked away to collect dust and Mick’s stories belong to no cabinet or mantelpiece. I don’t know yet who ever leaves Gleeson’s doorstep the happier. The listener or the teller? One thing is for sure the Gleeson’s aren’t too happy keeping memories bottled up. Mick’s late brothers Paddy and Brendan did more than their fair share to pass on a story. Outside the kitchen window Paddy’s hobby shed still hugs to the corner of the back garden. Less a ‘hobby-shed’ perhaps than Cratloe’s very own down sized G.A.A museum. Its walls are peppered with snapshots of Cratloe teams and hurlers from the 1930’s onwards. Right up to his passing Paddy was as common a sight at a hurling match as a referee and where he went, the camera always followed. Brendan earned his crust in Dublin and so instead passed on his pictures and wit through the nib of a pen. Mick is quick to show a bundle of poems pencilled by his brother but like the ‘The Cratloe Gaels’ that had me at his fireside, he needs no glance to carry them to the floor. Whether it was the murder of a gander at the Gullit or a hurlers fancy dress ball in Ballymorris, it seemed no event in Cratloe passed Brendan without it earning an eternity in verse. There have been a lot of changes since our president got his first run out in the Hollow. Not only in hurling but moreover in these parts. With no money to spend as a boy, Mick says all a Cratloe youngster used to do was hurl. Afterwards there was no pub but thirty or forty hurlers would sit around ‘Tobair an Airgead’ - the well down from his house. How things may have changed on both counts! The well is a haven for brambles these days and the famed hollow shrinks further beneath the new pitches evergreens. Maybe with Mick Gleeson in as president the old is again tied to the new. While in office it is his wish to see Cratloe win a Senior Championship. “We’re a bit small”, he says… “but we could do it”. There’s a pause and then comes the smile … ‘against the Bridge maybe’. Can I have a picture of the 43’ team to throw in with this Mick? I ask at the door. “Would you believe it,” he says, ‘of all the photo’s that were taken there’s none! And in the car home I thought to myself…. ‘sure there’s little need for it with Mick around.